Earlier in the month we examined a Feb. 13th Guardian article written by Sarah Helm, “It’s too late to stop the senseless capture of Palestinian land”, a propagandistic tour de force which amplified the prophetic anti-Zionist musings of a Palestinian “cartographer“ named Khalil Tufakji. As we noted at the time, whilst it’s unclear where precisely Helm was driving, she certainly wasn’t driving through the historic 3,000 year old Jewish cemetery adjacent to Jerusalem’s Old City – for the simple reason that there is no such tunnel at that location! We considered that Helm may have conflated the fake Mount of Olives tunnel with the real Mount Scopus tunnel (Derech Har HaTsofim Tunnel) quite a few kilometers away. We complained to Guardian editors and, ten days later, we received a reply, implicitly acknowledging that the journalist was in fact driving through Mount Scopus, as we surmised. However, instead of correcting the grossly misleading text, editors decided to argue that though Helm was driving through Mount Scopus Tunnel, it’s not wrong to refer to Mount Scopus as Mount of Olives. We understand that the tunnel known as the Mount Scopus tunnel goes through the Mount of Olives ridge. The description here by the Jerusalem expert Eli Schiller states in part that: “The Mount [of Olives] has three prominent peaks: Mount Scopus, 826 m, A Tur (Church of the Ascension) 816m, and Mount of Corruption, 746m”. For the purposes of the article, we think it is sufficient to leave the reference to a tunnel through the Mount of Olives as it is. Let’s be clear about what this answer represents. 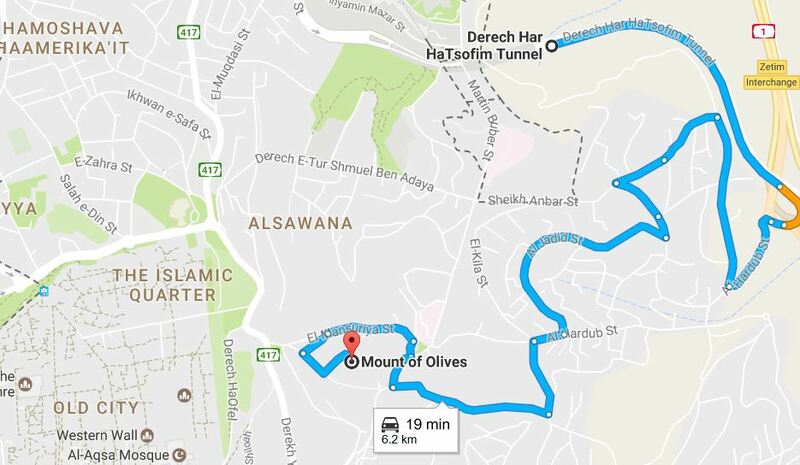 Editors knew they couldn’t argue the facts in ordinary language (using regular maps), so they pivoted to an obscure geological justification – concerning what constitutes the broader Mount of Olives ridge – for Helm’s claim that she drove through a tunnel at Mount of Olives. Of course, the sentence about driving through Mount of Olives would have immediately evoked, to the overwhelming majority of Guardian readers, a very specific visual of the iconic and historic Mount of Olives cemetery. They certainly wouldn’t have considered – yet alone researched – the geological nature of the area in question. If they had decided to investigate the claim further, they would have more likely just consulted a regular map (like Google Maps, seen above), and seen that Mount of Olives (in the ordinary use of the term) represents a distinct and unique Jerusalem location. Indeed, the context and aim of the passage about the tunnel “through Mount of Olives” written by the Guardian journalist seems clear: to support her Palestinian protagonist’s narrative that Israel is encroaching on and desecrating Palestinian land and historical sites in the holy city – making peace impossible and war inevitable. A tunnel through Mount Scopus simply would not have had the desired rhetorical impact as a tunnel through Mount of Olives, and certainly wouldn’t have helped support the story of Israeli malevolence she wanted to tell. We have appealed the Guardian decision and will update you as warranted. When it comes to Israel this story sums up the Guardian’s problem……………..tunnel vision! It’s no wonder Donald Trump included the Grauniad on his list of news organisations banned for publishing FAKE NEWS. The Lincoln Tunnel goes under the Empire State Building, because the tunnel goes into Manhattan and the ESB is in Manhattan. That’s close enough. ‘To inform readers’. How the Guardian must hate that phrase. What will they not do to somehow associate Israel with wrong-doing while, at the same time, sanitizing Palestinians/Arabs. Distortion of reality to more conform with Guardian Editors fantasy world. There is a reason why one mount is called Mt. Scopus and the other is called Mt. of Olives: they are two different mounts! Helm didn’t say that she traveled trough Mount of Olives Ridge tunnel, did she?